Here is an interesting title hot off the press from Osprey - T-62 Main Battle Tank 1965-2005, just in time for the release of the first of Trumpeter's nice 1/35th scale T-62 tank kits. This title, authored by notable armor expert Steven Zaloga, provides one of the first English-language histories of this tank. Consider this title the 'short course' on the subject as I am certain that the details of this tank's development, combat operations, and field upgrades would fill several hundreds of pages. Indeed, the author has compiled a 'short course' on the T-62 from its roots in the T-54 and T-55, its sidebar into guided missile rounds and different track system with the T-64, and its ultimate segway into the T-72. What is particularly interesting is the combat summary of the Syrian T-62 operations in the 1973 war and the Israelis' ability to plink these tanks into oblivion. 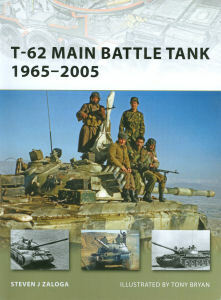 The book contains a nice range of black and white and color photography of the variety of T-62s in Soviet, Warsaw Pact, and allied (third world) service. In addition, there are numerous color profiles illustrating the range of tactical camouflage schemes over the life of the vehicle and some of the more distinctive modifications to the tank. This book is a must-have for the modern armor warfare historian and military analyst to understand how this weapon was designed and employed in combat. This title is recommended! My sincere thanks to Osprey Publications for this review sample!